The purpose of the conference is to give an opportunity to the American Fulbright student grantees to present the progress on their projects. We truly hope that you will be able to attend. Benefits of LL.M. Study in the U.S.
Fulbright EducationUSA Advising Center, 1082 Budapest, Baross utca 62. First Floor, Room 111. A one-year Master of Laws (LL.M) degree helps strengthen a lawyer’s ability to interact with foreign lawyers and companies, or to study a specialized field. It also opens an avenue to take a state bar examination in the U.S. to seek admissions to the bar. Location: 1082 Budapest, Baross utca 62. Ebben az évben szeptember 9. és 13. között a Hungexpo Budapesti Vásárközpontban kerül megrendezésre az Oktatás Hete program. A Budapesti Fulbright Bizottsággal és a Nemzetközi Oktatási Intézet Európai Irodájával együttműködve az Amerikai Nagykövetség is kiállítóként jelenik meg, hogy népszerűsítse az Egyesült Államokban folytatott továbbtanulást. Látogatóink teljeskörű tájékoztatást kapnak a lehetőségekről, illetve információs anyagokat vihetnek magukkal. Ide kattintva ingyen regisztrálhat a szerdai napra (szeptember 9.). A regisztrációt követően e-mail címére kap egy vonalkódos belépőt. Ezt kell kinyomtatni és a bejáratnál bemutatni. The Hungarian-American Fulbright Commission kindly invites you to the Fulbright Student Conference of AY 2008/2009. The purpose of the conference is to give an opportunity to the American Fulbright students to present the progress of their projects. Three returned Hungarian high school teachers will also speak about their Fulbright teaching experiences in the US. The second ‘America Week’ is organized in Veszprém in 2009 with a series of events dedicated to the study of American culture. General information session about an American LLM Program, types of LLM degrees offered, LLM experience generally, typical application process. 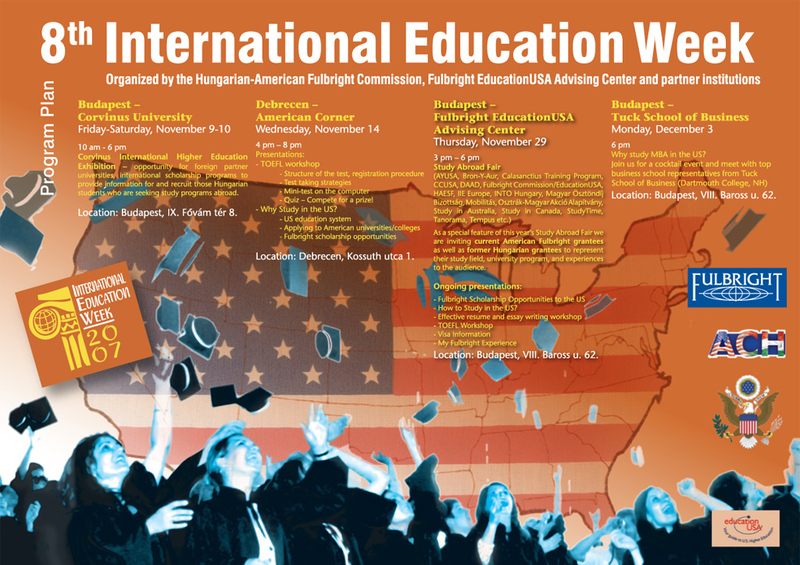 Please join us on Thursday, April 2 at 2 pm at the Fulbright EducationUSA Advising Center – 1082 Budapest, Baross utca 62. (corner of Rigó utca) 1st floor, room 111. Attendance is free, but advance registration is kindly requested (limited to 20 participants). Meet face-to-face with the MBA admissions officers and alumni of the world’s top business schools to help you make your business school selection. Address: Corinthia Grand Hotel Royal, 1073 Budapest, Erzsébet körút 43-49. May 25-30, 2008 Washington, DC. attracted 9,600 delegates from over 140 countries and highlighted a joint presence of the Visegrád Countries Fulbright Commissions. NAFSA, the Association of International Educators is a member organization promoting international education and providing professional development opportunities to the field. Continuing the tradition of the previous years, the Fulbright Advising Center brings together a group of organizations administering scholarships and internship opportunities, and representing international higher education exchange programs. As a special feature of this year’s program, current American Fulbright grantees and former Hungarian Fulbrighters are invited to represent their fields and universities. Invited institutions are: Florida Institute of Technology, University of Pittsburgh, University of Arizona, Vassar College, AYUSA, Bron-Y-Aur, Calasanctius Training Program, CCUSA, DAAD, Fulbright Commission/EducationUSA, HAESF, IIE Europe, INTO Hungary, Magyar Ösztöndíj Bizottság, Mobilitás, Osztrák-Magyar Akció Alapítvány, Study in Australia, Study in Canada, StudyTime, Tanorama, Tempus, etc. Attendance is free, but advance registration is kindly requested (call: 1-462-8050). World MBA Tour – your opportunity to meet admissions directors and alumni of up to 120 of the world’s top business schools. Location: Marriott Hotel, 1052 Budapest Apáczai Csere János u. 4. 1088 Budapest, Reviczky u. 6. Preparing for Global Competence: TOEFL and Other ETS English Language Tests and Learning ToolsThe Institute of International Education (IIE) European Office, on behalf of the Educational Testing Service (ETS), invites English language teachers and interested professionals to a one-day Professional Development Seminar. International Education Week November 18-19, 2003; How Can I Study in the US? International Education Week November 20, 2002; How Can I Study in the US? International Education Week November 12-16, 2001; How Can I Study in the US?